A shark fin glides ominously near unsuspecting holiday beach swimmers, a crescendo of musical peril rising – “DA da, DA da, DA da.” A giant, rolling boulder nips menacingly at the heels of a fleeing, ragged archaeologist. The glowing, spiky finger of a goggle-eyed alien points from a California suburban street into space. While the craggy visage of America‘s stovepipe-hatted 16th president may not yet be as ingrained in American pop culture DNA as those iconic movie moments of the past 40 years, the celluloid depiction of Lincoln – which won the most Academy Award nominations this year with 12 – shares the distinction of being crafted by the same movie magician responsible for six of the 25 highest-grossing movies of all time. Steven Spielberg has not only shaped our fantasies, but with “Lincoln” he has influenced the perspective that a generation of Americans will have on a key part of history. As an audience of a several hundred million gathers for one of the planet’s global campfire moments Feb. 24, the popcorn-popping masses will await the verdict to see if Mr. Spielberg will win his third Oscar for Best Director – to tie such icons as William Wyler and Frank Capra – and remain behind only legendary John Ford, who won four. 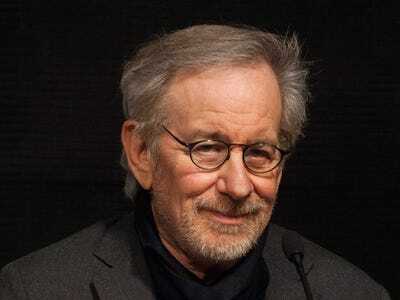 Over bowls of steaming chilli at home, and around office water coolers, fans and critics may debate what this year’s best movie is, but one thing is certain: Love this director or demean him, Spielberg’s movies are woven more deeply into the fabric of American daily life and culture than those of any other director in history. He burst onto the world stage with “Jaws” in 1975. With just two road-movie thriller features – “Duel” and “The Sugarland Express” – under his belt, Spielberg originally conceived the Peter Benchley bestseller as a low-budget creature-feature. But he ran into so many production problems filming realistically on water – from a malfunctioning robotic shark to a drunken British lead actor – that he had to reconceive his vision of horror right on location, deciding to keep his deep-sea monster lurking mostly off-screen. Spielberg’s counterintuitive improvisation paid off, showcasing his populism across the spectrum from substance to style in actors, scripts, plots, conflict, tone, and all the rest. The first of many cultural catchphrases was born – “We’re gonna need a bigger boat” – as well as an industry-changing marketing phenomenon that could only have been launched in America: the summer blockbuster. “Jaws” was the first movie to earn more than $100 million in theatrical rentals. This distinction also earned Spielberg criticism – along with his “Star Wars” director buddy, George Lucas – for infantilizing movies and forcing studios to spend their resources on fewer and higher-budget movies.